Meal Notes: This teriyaki marinade stores well in the fridge, so you can make it a couple of days in advance and have it ready whenever it’s time to start dinner. It also pairs well with steak or chicken, making it one of my go-to recipes. On top of it’s versatility, this marinade is also absurdly healthy. I was skeptical when I saw there was no sweetener, but I can now personally vouch for the fact that it doesn’t need one When I’m feeling fancy, I serve this salmon with mushroom risotto and salad. Alternately, it goes well with a simple side of rice and roasted broccoli. Prep Ingredients: Mince garlic and ginger. Roughly chop cilantro. Line a baking sheet with aluminum foil and place a baking rack on top. Make Marinade: Mix together all ingredients except salmon together in a medium-sized shallow bowl. Marinate Salmon: Add salmon to bowl with marinade. Let salmon marinate in the refrigerator for about 30 minutes. * In the meantime, preheat your broiler to high. Cook Salmon: Spray or brush the baking sheet with a little olive oil, then place salmon on the rack. Pour some of the remaining marinade on top and then stick it in the oven. Cook for about 8 minutes (depending on thickness), then remove from the oven and flip the salmon. Pour some of the remaining marinade on top and return to the oven, cooking for another 8 minutes or until done. *If you decide to use this marinade recipe with steak or chicken, you can marinate the meat for up to 24 hours. While fish tends to become mushy if marinated too long, steak and chicken just become more delicious. 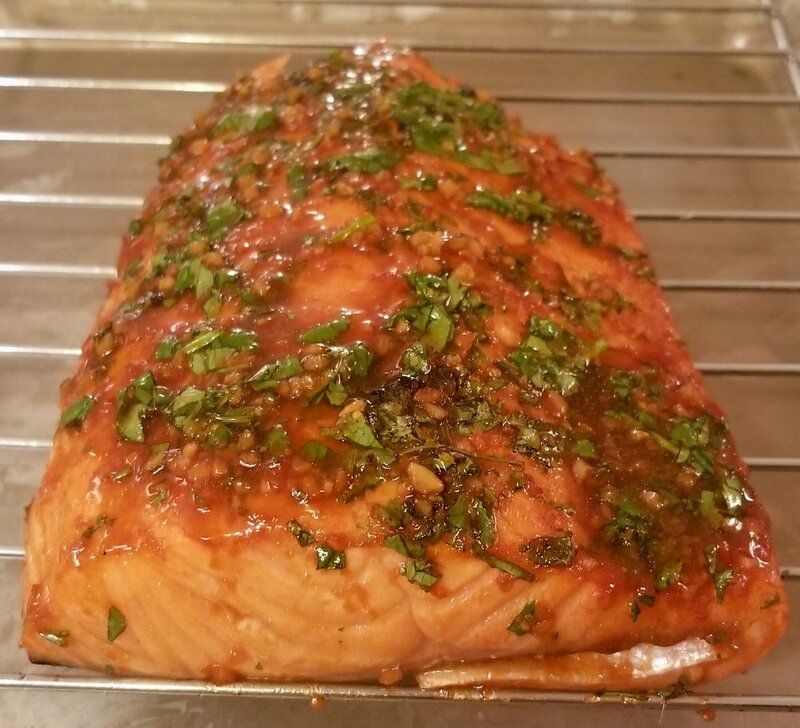 ** The source recipe recommends making this salmon on a gas grill, which I don’t own. If you do, I’m sure it would work great. If not, the boiler works just fine.